Because most boat galleys are small and most anchorages aren’t close to Whole Foods, preparing a good meal on a boat is quite unlike doing so ashore. Carolyn Shearlock and Jan Irons learned this when they and their husbands made the jump from racing small one-designs to a charter in the BVI and subsequent cruising boat ownership. With more than 20,000 cruising miles between them, they’ve co-written a comprehensive guide to shipboard cooking that will give even “non-cooks” enough confidence to produce tasty meals out of an icebox, without prepared foods, and on a one-burner stove in a tiny, moving kitchen. Included are hundreds of boat-friendly recipes that can be made from readily obtainable ingredients with hand utensils, and step-by-step instructions on such things as making yogurt and bread, grilling virtually every food imaginable, preparing and cooking freshly-caught fish and seafood, cutting up and boning meat, cooking in a Thermos and baking on a stove top. There’s also a host of practical tips on everything from substitutions, provisioning and food storage to troubleshooting oven hot spots and more. 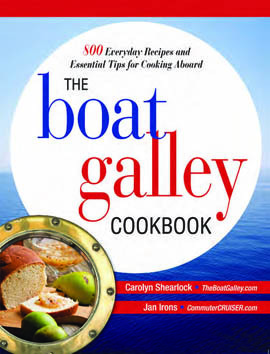 Carolyn Shearlock’s articles have appeared in Cruising World and SAIL and she writes TheBoatGalley.com, where you’ll find over 400 articles about provisioning, food storage and galley cooking. Jan Irons’ articles have been published in Cruising World, SAIL and Blue Water Sailing, and she produces commuterCRUISER.com, featuring more than 400 articles with practical tips and information for part-time cruisers. A well-fed crew is a happy one, and whether your sailing plans include a family weekend, the Marion Bermuda Race or a ‘round the world voyage, you need to own The Boat Galley Cookbook. The print edition and several e-book formats are available at amazon.com.